F3WSINC wants to make businesses and their customers superheroes by giving them opportunities to raise money for literacy initiatives around the world. The Consortium on Chicago School of Research released a study indicating a child’s third grade reading level correlates to whether they will graduate and move on to college. $4.95 buys a latte. $4.95 per buys 1 child 1 hour of VPK instruction. For the price of a latte you can help decrease illiteracy around the world. Strong literacy rates strengthen communities by breaking the cycle of poverty, lowering unemployment, and boosting self-esteem. From December 2012 to March 2014 F3WSINC pledges to give $1 dollar out of every $10 dollars generated from the sales of the book Superheroes Wear Faded Denim. Not only this when you support participating businesses throughout the campaign, you aid our community in funding literary initiatives at established non-profits. 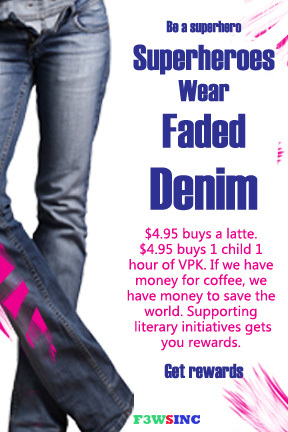 Buy a copy of Superheroes Wear Faded Denim for opportunity to receive rewards from participating businesses. Choose to donate at participating businesses. Be a Superhero. Get rewards. This campaign assumes no fiscal responsibilities and/or liabilities to participating organizations. All donations will go directly to participating non-profits for the support of literacy initiatives.